Be sure to visit our sponsors and thank them for their generosity! 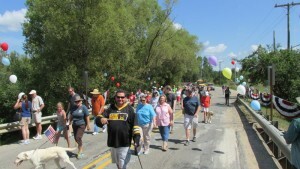 Our 26th Annual Bridge Walk was a huge success! Record-breaking crowds and funds raised! Almost ten thousand dollars benefiting the Lovells Township Fire & EMS Department! Don’t miss next year’s event scheduled for Saturday, August 18th, 2018! Luncheon will again be sponsored by dead Bear Brewing Company! Begin your day with the Fireman’s Pancake Breakfast under the Pavilion from 8 AM to 11 AM. Buses will begin shuttling to the parade route at 11:30 AM. Parade and Bridge Walk commence at noon followed by the community luncheon! 50/50 drawings and prizes throughout the day. Silent Auction. Children’s games. All proceeds benefit the Volunteer Fire & EMS!